"This thing is a wonder of nature. Hardly a day goes by that we don't remark on its sheer power and speed - often five knots - the very aspects that make working out here exceedingly difficult. One knot of current is comparable in force to 20 knots of wind, and even a moderate wind blowing against the current sets up seas totally out of proportion to those in less dynamic regions. So it's no coincidence that this is the home of freak waves, some reported by damaged ships in excess of 80 feet trough to crest. We put instruments into the current, and it seizes control of them as if they were its own. If Knorr has to steam into the current, the Agulhas peels off half her normal cruising speed. Lisa has set her study line ("ACT Array" on the accompanying graphic) in the teeth of the current where it sprints southwestward along the South African coast. But the velocity she's been measuring and the changes thereto over time carry implications for the entire Agulhas System. Let's take a snapshot glimpse at that system. When the current pokes its nose beneath the African continent and comes under the influence of the heavy west winds, it takes a sharp left-hand turn, the "Agulhas Retroflection" in technical lingo, and then heads eastward toward Australia. But that's not the extent of the system. 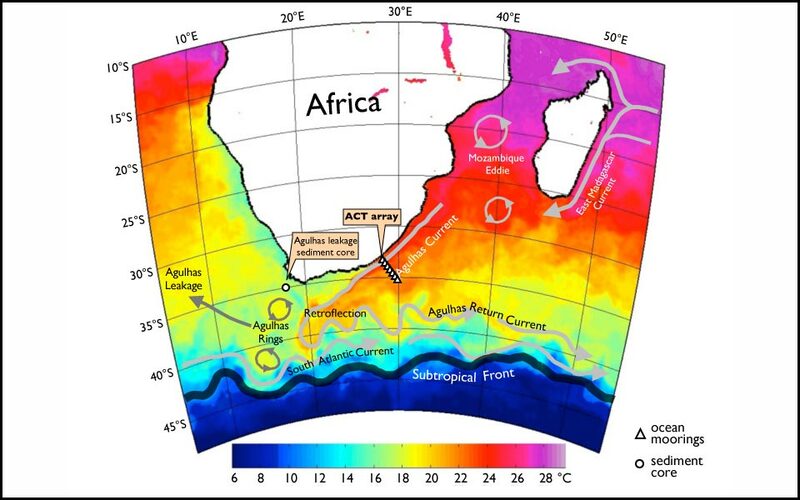 When it makes that radical eastward turn, it spins off wheels of water called Agulhas Rings that make their way into the South Atlantic and, in fact, far beyond, joining and influencing the broad-scale circulation in the North Atlantic. This to me exemplifies a most marvelous truth revealed by oceanography. There is only one, singularworld ocean. Each, named differently only for human convenience, communicates via currents with the adjoining ocean to comprise an exquisite, unified whole. This, for its own sake, makes the global ocean system worth studying, and you don't need to be a scientist to appreciate it. But there is a more practical, more immediate reason for studying the parts, the Agulhas Current, for instance, in order to understand the global whole. Because the wind blows and Earth rotates, oceans transport nearly unimaginable quantities of heat from where there is too much (the tropics) to where there is too little (the high latitudes) and back around again. That they do so moderates global climate and makes our Earth far more conducive to biological diversity, to life itself, than if the oceans were nascent. However, now that we humans with our love affair with carbon fuels have ascended in our own right to the level of a geophysical force, we're changing our climate. Signals of change will be found in the ocean by scientists, because in the long term the ocean captains the climate ship and that's a fine reason to look over their shoulders as they search the seas.